Tulsa – The Grand River Dam Authority’s innovative “Rush For Brush” program, which has focused on fisheries enhancement of GRDA lake waters for over a decade, was recently recognized by Congressman Markwayne Mullin (OK-2). Debbie Dooley (right), Field Representative for Congressman Markwayne Mullin, presents a “Certificate of Special Congressional Recognition” to GRDA President/CEO Dan Sullivan (center) and GRDA Vice President of Ecosystems and Lake Management Dr. Darrell Townsend. The certificates was in recognition of GRDA’s “Rush For Brush” fisheries habitat enhancement program. 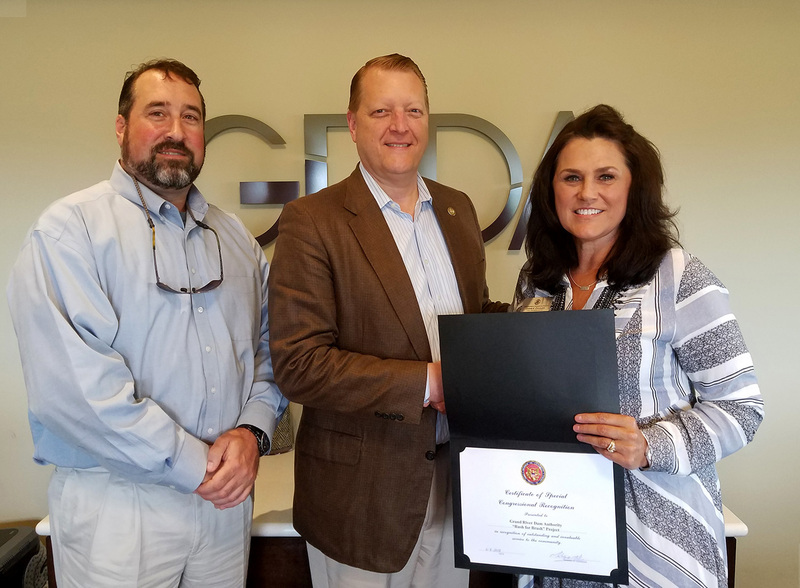 In early June, Mullin’s Office presented the GRDA program with a “Certificate of Special Congressional Recognition” to honor its years of success in constructing and deploying thousands of artificial fish habitats in the waters of Grand and Hudson lakes. Those habitats – built by volunteer labor with materials supplied by GRDA – provide cover for small fish and, in turn, create a fish attractant which is popular with area fishermen. “Rush For Brush” has grown in popularity and participation every year since its 2007 beginning. Earlier this year, it also received the National Hydropower Association (NHA) “Outstanding Stewards of America’s Waters” award.